Qai Qai, the doll of Serena Williams’s daughter Olympia Ohanian, 1, is an Instagram hit and already amassed 89,200 followers. Her coverage of the Australian Open from the prime position at Rod Laver Arena is growing in popularity. Serena’s daughter is no stranger to the social media with 540 000 followers on Instagram but now Qai Qai pronounced Qway Qway steals the headlines and the number of followers during her first trip to Australia. “I wanted her to have a black doll”, Serena Williams told the reporters. 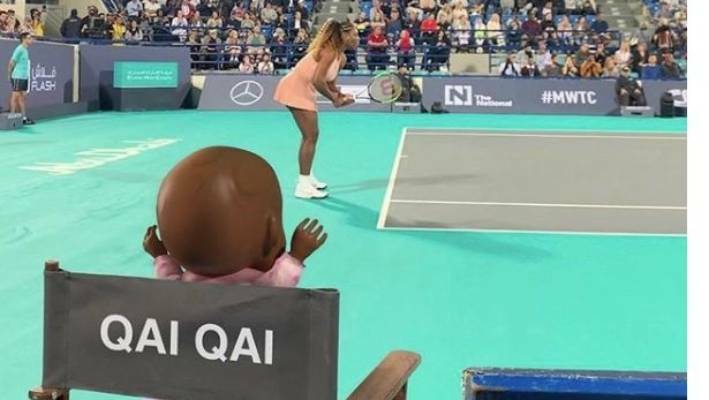 Adorable photos of the doll at the tennis tournaments around the world with Olympia and her parents abound on the RealQaiQai Instagram page. The page, operated by Reddit founder and husband of Serena Mr. Ohanian made QaiQai the subject of an interview in Melbourne this week.